Last month, we saw effective results from our programs targeting children’s road safety and helmet use, spoke to communities about the importance of wearing helmets through outreach projects, and witnessed over two thousand parents exchange their low-quality helmets for those of high-quality. In June, the Community Preventive Services Task Force published reinforcing evidence on the need for universal motorcycle helmet laws in order to reduce fatalities and injuries. Evidence shows that when universal laws, rather than partial helmet laws or no law, are implemented, there are substantial increases in helmet use and decreases in motorcycle-related fatalities and injuries. With our commitment to road safety and to support the UN Decade of Action for Road Safety goals, we aim to strengthen our advocacy efforts for progressive legislation to reduce unnecessary deaths and injuries among motorcyclists. Please see below to read more on AIP Foundation’s activities this past month. Students' helmet use has sky-rocketed following a donation of 4,057 helmets to students and teachers at 39 schools in April. Across seven new schools, students’ helmet use increased significantly from five percent before the donation in April to 93 percent in May. Schools that had previously received donations also maintained high helmet use rates after implementing educational activities: 81 percent in April and 83 percent in May. This is the third year of the Johnson & Johnson Helmets for Kids sponsorship in Dong Nai, Ha Tinh, and Quang Binh provinces. Johnson & Johnson will revisit these schools in September to donate 6,000 additional helmets to newly enrolled students. A rigorous helmet observation methodology, developed in partnership with the U.S. Center for Disease Control (CDC), was implemented in April 2014 that incorporated strategic filming of the traffic flow outside of the schools. With this new monitoring method, AIP Foundation was able to more accurately observe the increase in student helmet use rates. From December 23, 2013 to January 17, 2014, the ‘Walk with FedEx Tour’ educated 12,943 students on safe pedestrian safety. 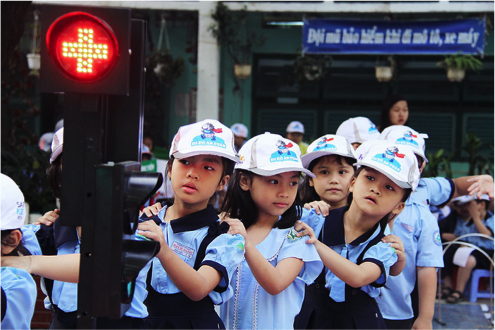 Participating schools hosted a ‘Safety Day’ where AIP Foundation (as Safe Kids Vietnam) and school leaders organized pedestrian safety sessions, simulation corners, educational games, and distributed pedestrian safety booklets and reflective caps. Safe Kids Vietnam later presented a comedy skit at each school in April to emphasize pedestrian safety to students. After five months of implementation, the final results show impressive program influence. From pre- to post-‘Walk With FedEx Tour’ implementation, students’ use of sidewalks increased from 35 to 80 percent, crosswalk use increased from 66 to 78 percent, and students involved in a crash decreased from 24 to 19 percent in the last six months. These encouraging results reinforce the importance of road safety education and program implementation among children. The American International Group (AIG), a multinational insurance corporation, and AIP Foundation announced their partnership to support the road safety program Helmets for Kids this month. The event marked the start of the school-based program at Trung Vuong Primary School in Hoan Kiem District of Hanoi. Through AIG’s sponsorship of the Helmets for Kids program, all 1,845 students and eighty teachers at the school will receive quality helmets. Additionally, the larger school community, including parents, will receive valuable road safety education throughout the 2014-2015 school year. 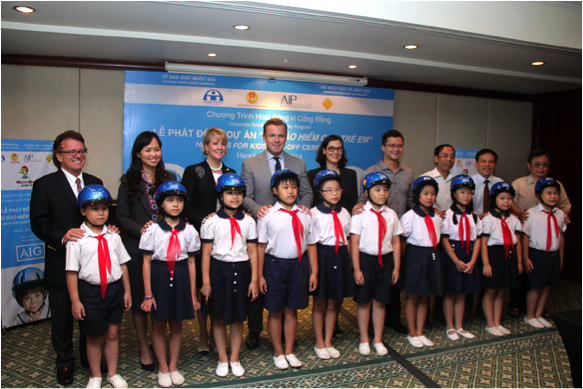 This program is part of AIG’s long-term initiative to promote road safety in communities throughout Vietnam. 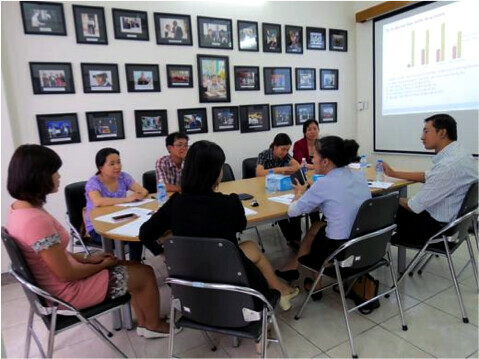 A year-end meeting took place this month to present achievements, challenges, solutions, and lessons learned from the Helmets for Families project in Vietnam. The meeting took place between AIP Foundation, local authorities, and representatives from the program schools supported by Abbott Laboratories. Similar to the Helmets for Kids program, Helmets for Families adds a new element that focuses on parents with the goal of changing parent behavior on standard helmets and helmet use. Prior to the Helmets for Families program, the average helmet use rate among students across the four target schools was only 27 percent, with 81 percent of those wearing sub-standard, low-quality helmets. 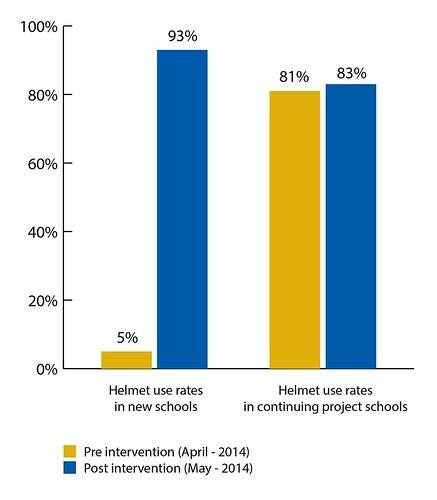 After program implementation, this rate increased significantly to approximately 84 percent of students wearing helmets, all of which are standard-quality. In addition, AIP Foundation conducted pre- and post-intervention parent surveys. Results indicate that correct knowledge of standard helmet use increased from 18.5 percent to 62 percent after parent training. After learning of the importance of wearing not just a helmet, but a high quality helmet, 2,116 parents from Abbott Helmets for Families project schools participated in a helmet exchange. Following this success, AIP Foundation worked with the Ho Chi Minh Traffic Safety Committee and the People’s Committees of Binh Chanh District and District 12 to further the exchange of helmets in the surrounding communities. 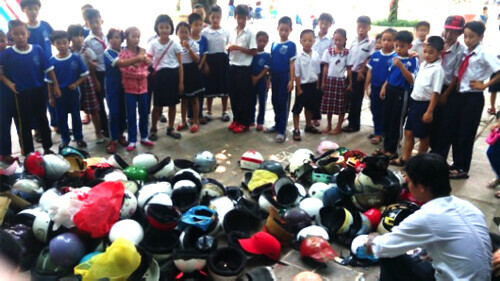 In total, 1,351 “eggshell” helmets in Binh Chanh District and 819 from District 12 were exchanged for much needed high-quality helmets. In a powerful display of helmet quality support—and one that excites students—all of the sub-standard helmets were destroyed on project schools’ premises. Road fatalities in Cambodia rise to 1,170 in six months—The number of road fatalities in Cambodia has risen to 1,170 so far this year, up 11 percent compared to the same period last year. Some 2,600 cases of road accidents have been reported since the start of the year, up 15 percent from the same period last year. Main causes of the accidents were high-speed driving (45 percent), alcohol driving (14 percent), and overtaking driving (10 percent). 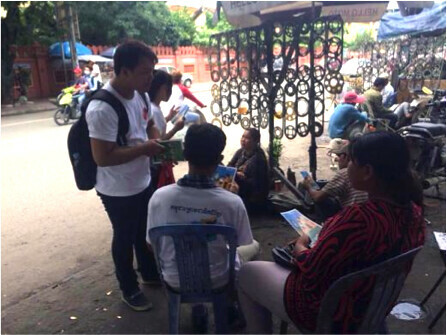 On July 31, AIP Foundation's Cambodia team conducted community outreach to promote passenger helmet use through the Helmets for Families program supported by Manulife Cambodia. Community outreach volunteers, selected from AIP Foundation training sessions, reached hundreds of people in the community surrounding the Wat Preah Put Primary School by distributing educational materials on the importance of helmet use and the road crash situation in Cambodia. Posters containing road safety information were placed in strategic high-volume centers to encourage the community to wear helmets. Volunteers also informed the community of the upcoming legislation amendment, which will require passengers to wear helmets.